Internships provide an essential link between the classroom and workplace, are a good source of professional input, and are helpful to finding good job after graduation. 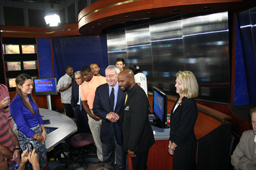 Every step of the process offers valuable hands-on experience toward the goal of becoming a media professional. The first step to completing an internship is to determine your eligibility. To qualify for an internship the Department of Mass Communication and the College of Fine Arts and Mass Communication requires that you complete the following requirements. ____ Declared MCOM as my academic major. ____ Completed a minimum of 18 hours in MCOM with a GPA of 2.75 or higher. ____ Have a grade of ‘B’ or better in ENGL 1364, 1365 and any technical writing courses. ____ Completed 72 hours of coursework with an overall GPA of 2.5 or higher. No. At this time you do not meet the minimum requirements for applying for an internship and should consult an academic advisor or your track coordinator for an alternate course option. Job description outlining the duties and responsibilities of the internship. A description of the professional job experience you hope to gain through this internship, including professional skills, new information and personal development. Select Completed Internship Application link above. For the signature field, select the "Digitally Sign Document" icon and follow the instructions for signing the form either using your existing Digital ID or creating a new one. Select the Save icon and save the file to your computer. The signed file can be emailed as an attachment to the Internship Coordinator.